Either way, we can supply a wide range and we'll find the best value option for you: Click on a brand below to get details. We aim to have the most competitive prices around for all our shocks, so if you can find a better deal elsewhere please give us a call.The price shown is the price you pay, including vat and delivery to most areas of mainland UK. Monoshock Brands - Select ....or just scroll down ! Check that there's a BETOR shock listed for your bike on "Click For Applications" above. 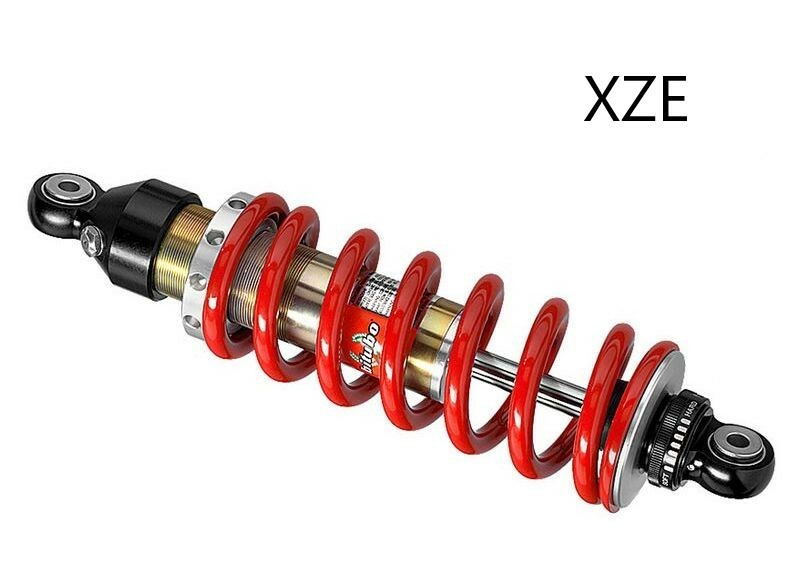 If so, we guarantee that this will be the cheapest decent quality shock available for the bike. You are not committed to buying a shock by sending an enquiry. We will confirm suitability and availability, and email the price. 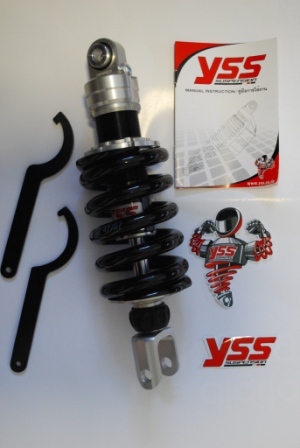 YSS monoshocks are available for most bikes, but there are several different models at different prices. Click to send an enquiry, and we will confirm price & availability. If so, we guarantee that this will be the cheapest decent quality shock available for the bike. You are not committed to buying a shock by sending an enquiry. YSS started out in 1983 making good quality budget shocks, - we sold loads of them. Then around 2001 the company moved upmarket. They partnered with leading European shock designers to produce a stunning range of shocks to fit most bikes in the park, from old hack to full race bike. They now make more than 2 million units annually, all ABE/TUV approved and all with a full 2-year warranty. 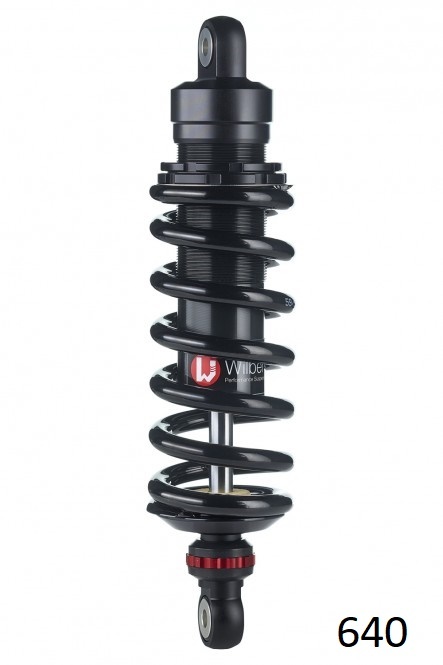 Built with the latest CNC technology, YSS shocks look and feel real quality pieces, and the lower manufacturing costs from building the shocks in Thailand mean that they are seriously good value. Remote hydraulic preload can also be fitted, price is £ 125 extra incl vat. 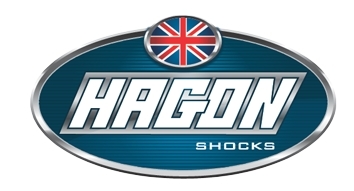 Since Alf Hagon’s motorcycle spares business took over Girling Suspension in the 1970s HAGONs have manufactured shocks for a very wide list of applications. Over the years the shocks have been improved enormously and new ranges introduced, and they sell in their 1,000s all over the world. 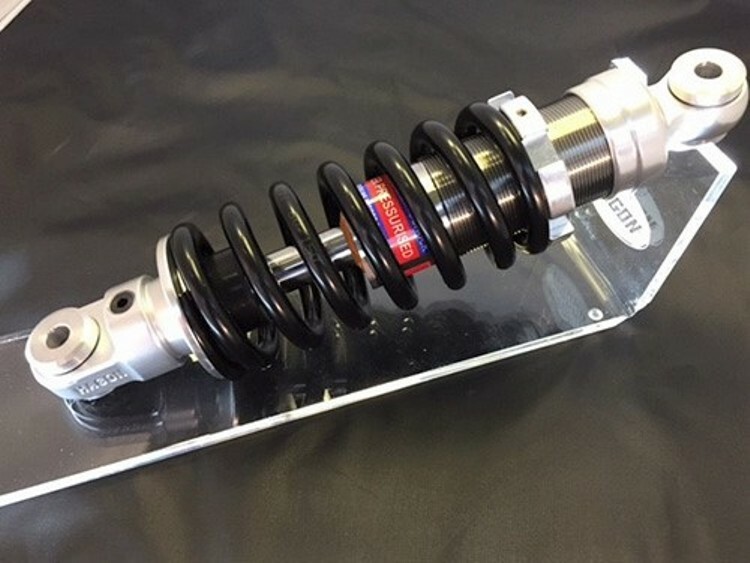 All their shocks are made in the UK, all come with the correct bushes to fit straight on to your bike, and all have a 2-year unlimited mileage warranty. EMC have been designing and building bike suspension in France since 1997. They're a smallish company, with a production of around 5,000 shocks per year, but they are real quality units. All shocks (except the entry level MT46) use triple tube technology, which results in a very well planted and comfortable ride. 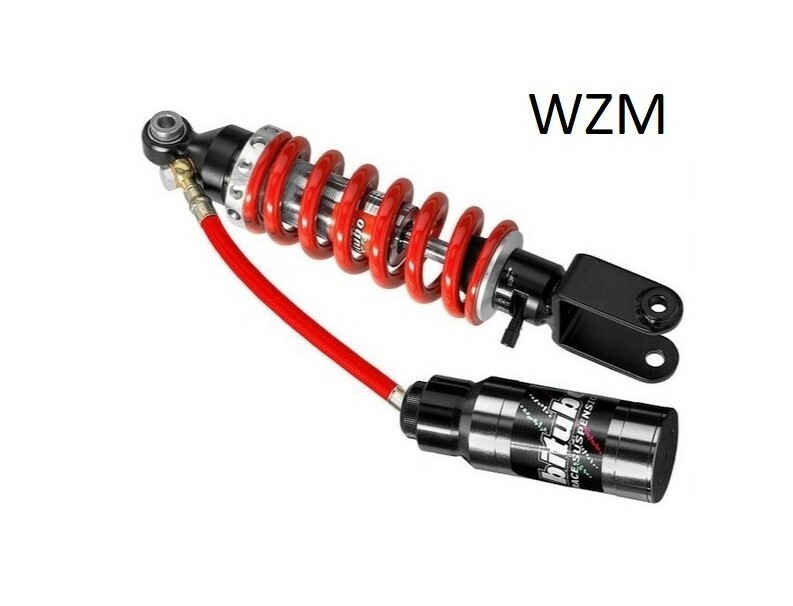 And while other manufacturers' shocks are separately adjustable for rebound and/or compression damping, EMC engineer their shocks so that the adjusters maintain a desirable ratio between the two, and impact more on fine tuning high speed and low speed damping. 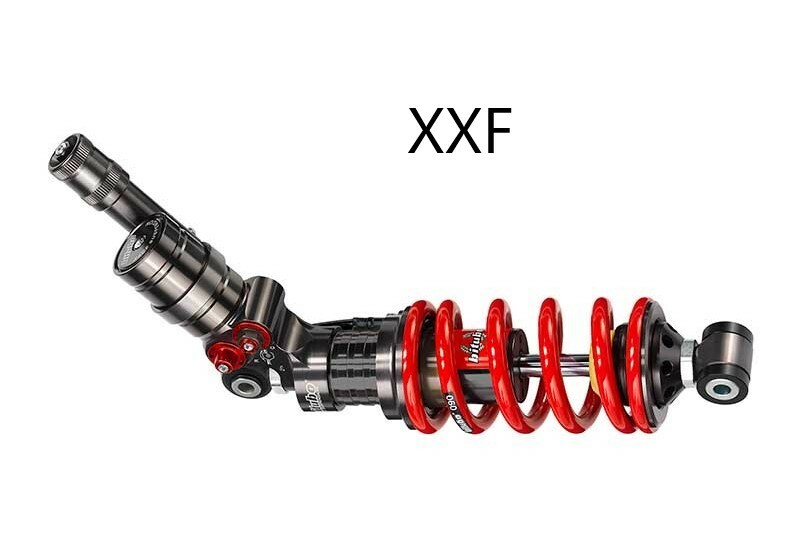 They have a wide range of applications covered by a range of 5 different performance level monoshocks, all built to order with the correct springs for rider weight and riding style. The MT46 range as the entry level shock has a double-acting gas monotube damper with gas volume compensator to maintain shock performance under varying conditions. It is steel bodied with alloy fittings, SKF ball joint mountings and stepless preload adjustment. Designed as a real improvement over the original shocks on road and trail bikes, the shock is perhaps a little expensive compared to other brands as it has no damping adjustment, but it is one of the cheapest built to order shock around. Sportshock 1 is the biggest selling range. It has a tri-tube, low pressure gas volume compensator damper mainly designed to optimize comfort with high movement speed damping adjustment. The rebound and compression ratio is already optimized and make adjustment easy. With 26 clicks, it has a wide range of adjustment to suit all tastes. Unlike an emulsion damper, the SportShock1 maintains a gas-in-oil suspension of consistent quality,giving a well-planted feel despite a poor road state or a rise in temperature. Sportshock 2 is a higher spec version of Sportshock 1, and still targetted at sporty riding on public roads rather than track use. The SportShock 2 is an easy to adjust low pressure gas volume compensator tri-tube damper. The rebound and compression ratio is already optimized, and damping controls for high and low speed movement are now separated. One 26-click knob controls the high speed movement like the SportShock1 (comfort) and the 26-click second knob takes care of of low speed movements (traction and stability). 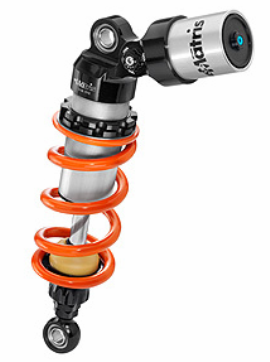 Sportshock 3 is designed for bikes regularly used on track days. The steel outer case of the Sportshock 1 & 2 is replaced by lightweight anodised aluminium, with a tri-tube low pressure gas volume compensator damper. The three adjusters allow separate high and low speed rebound damping, and high speed compression damping. The adjustment is easier and each setting has 26 clicks. Another advantage of the tri-tube system at low gas pressure is to maintain stability as the shock temperature rises. Also, low viscosity oil allows the dampers to maintain constant operation independent of the temperature. Sportshock 4 improves on the Sportshock 3 with 4-way damping adjustment, and is a shock recommended for high level competition use. It is a tri-tube low pressure gas volume compensator damper, even easier to adjust than the SportShock3. The rebound settings (high and low speed) do not influence the compression settings (high and low speed), so there is less trade-off in the setting up. The four 26-click adjusters allow the bike's handling and roadholding to be set up to accurately match track conditions and rider preferences. 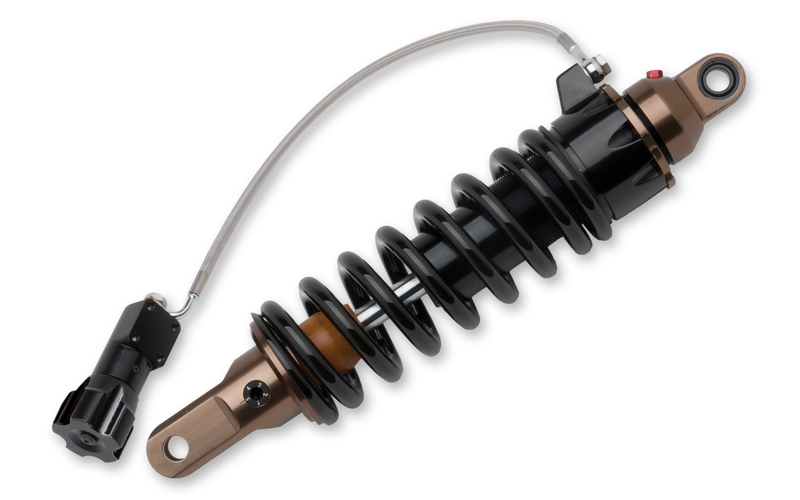 All EMC shocks are built to order with springs to suit rider weight and riding habits, with SKF ball joint mountings and stepless preload adjustment. All aluminium parts are machined from strong, lightweight 7075 billet aluminium by EMC. Most shocks can be fitted with a hydraulic preload adjuster, although as ever this is an expensive option at £170. We can arrange for EMC to build specials ie shorter or longer than standard to alter ride height, or length adjusters can be built in for an extra £ 60. Uprated shocks can also be specified for bikes with sidecars for a small extra charge. And if you prefer a black spring it's available for £20 extra. Made in France, delivery is normally 3 weeks. Italian firm Bitubo began making industrial shocks back in 1963, and moved into motorcycle race suspension from 1975, winning world titles and developing their strong racing pedigree within a few years. The company name comes from their legendary racing twinshocks which were connected by two compensating rubber pipes.... Since then they have continually developed their road and race winning products. The WZE range is principally for lightweight bikes up to 125cc, eg Aprilia RS125, and a few lighter 250's. They are Nitrogen pressurized, with oil/ gas separating floating piston, and stepless adjustments of both preload and rebound damping. 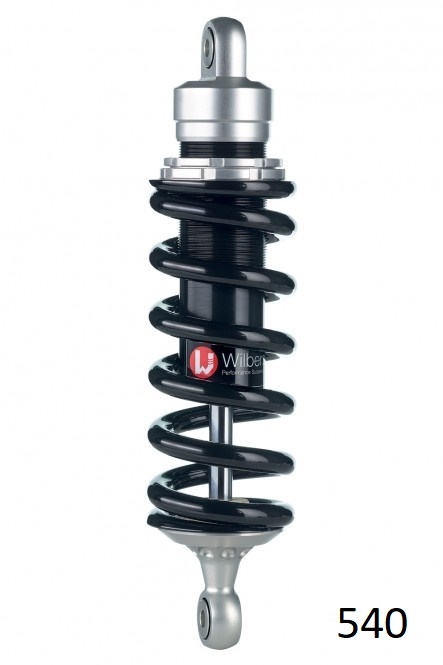 The picture shows a WZF shock, which is a range of only two shocks for Suzuki TL1000R & TL1000S. 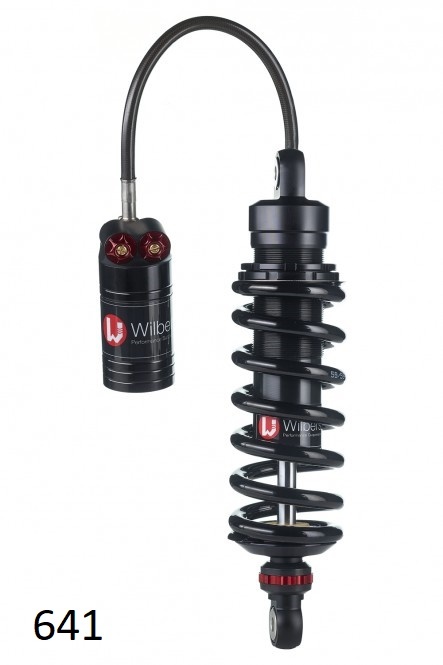 Unlike the WZE units these shocks have remote reservoirs, allowing both stepless rebound and 12-click compression damping adjustment as well as preload, and are compact enough to replace the original rotary dampers and springs to give a brilliant improvement. Heavy duty option available. The XZE range of shocks is a wide range designed to suit most road bikes. All are Nitrogen pressurized with oil/gas separating floating piston. Steel 45mm body, 14 mm steel rod with low friction surface treatment and billet Ergal heads with CNC machining, stepless preload and 7-click rebound damping adjustment. The XZE01 is the standard shock, while XZE11 adds adjustable length, and XZE31 adds remote hydraulic preload. Some applications benefit from the extra strength & stability of a 16mm rod - this is the CZE01 model (same price). The XXF range is aimed squarely at the race market. They have all aluminium bodies to minimise weight, and state of the art internals for improving the damping coefficient and increasing the stability at high temperature. A 14mm rod provides steady support, while the piston has been slimmed in diameter to 30mm to reduce the volume of fluid, and hence lower inertial forces, which increses controllability of the shock's movement. In addition, unlike some makes of shock all the adjusters are located near the top of the unit. ADJUSTMENT VALVES KIT: XXF shock absorbers can be easily and quickly modified by replacing the XD compression valve and XS rebound valve. The supplied set-up is labelled on the shock body. 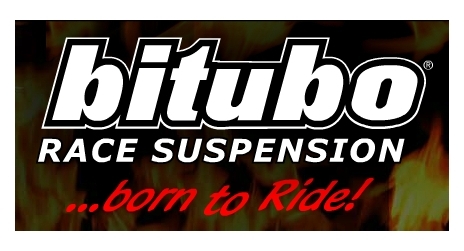 Bitubo Racing department has created specific set-ups for several bikes developed with the world champion teams and their riders, now available to you, the enthusiast, with specific damping coefficients. Complete valve kits in single or double speed are available, with their performance graphs. The shock is fully rebuildable. Where an exact price cannot be quoted due to different prices for different bike models, there is no commitment in placing an order. We will advise price and availability before you decide whether or not to confirm the order. 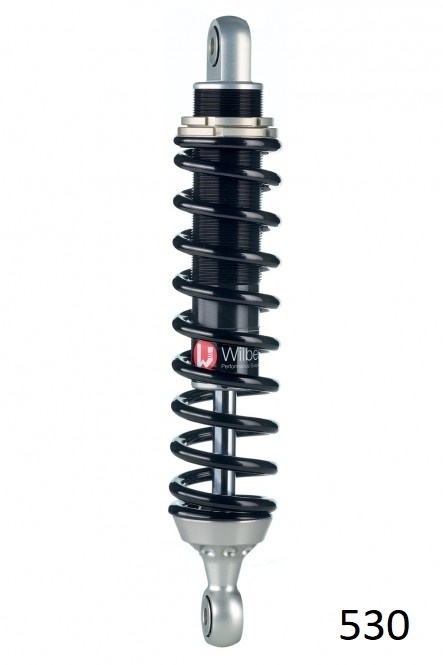 German company Wilbers are one of the largest shock manufacturers in the world despite making only very high quality (and therefore not cheap) shocks. 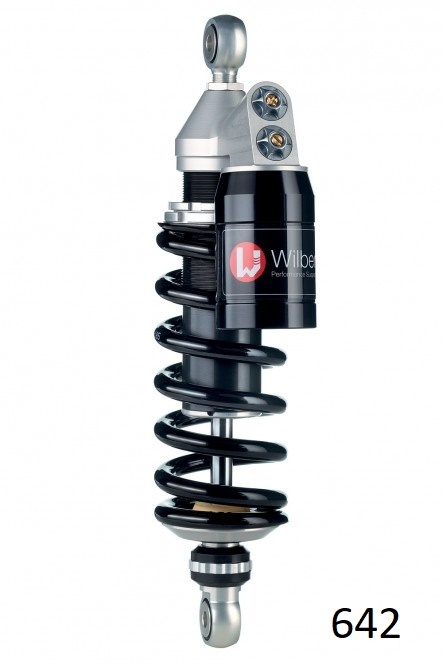 They are also one of the few manufacturers who extend their warranty beyond 2 years - Wilbers shocks are warranted for 5 years, although you need to have them serviced after 2 years to activate the extended period. Uniquely, apart from the Ecoline range you can specify the spring colour. Standard options are Blueline, which have blue springs, Blackline which have black springs, or Nightline which are all black (and more expensive - please ask for a price). But for an extra charge you can select almost any colour, and there’s a handy page on Wilber’s website which shows how the many available colour options will look. See it at http://www.wilbers.de/ral.php. Having a special colour cost £50 extra, and can add 2 weeks to the delivery time. Wilbers build their shocks to order, to suit rider weight and riding style, and all are of course fully rebuildable. Expect around 3 weeks from the day the of order to delivery. 530- and 540-series shocks form the Ecoline ranges. They are road bike shocks with preload adjustment only: 530s have 36mm diameter pistons, while the 540s are wider shocks with 46mm pistons. 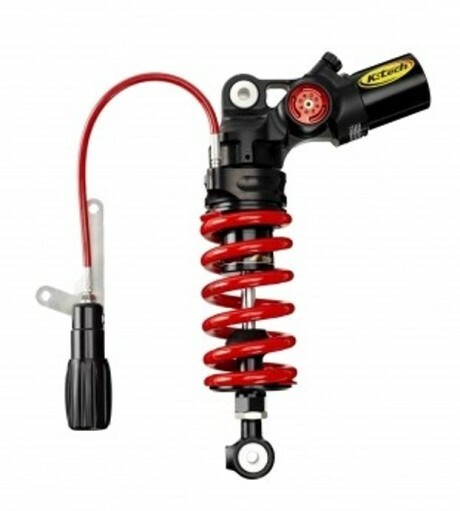 Ecoline shocks are available with black springs only. 630- and 640-series shocks are part of the Adjustline ranges. They are road bike shocks with 22-click rebound damping adjustment in addition to preload: 630s have 36mm diameter pistons, while the 640s are wider shocks with 46mm pistons. 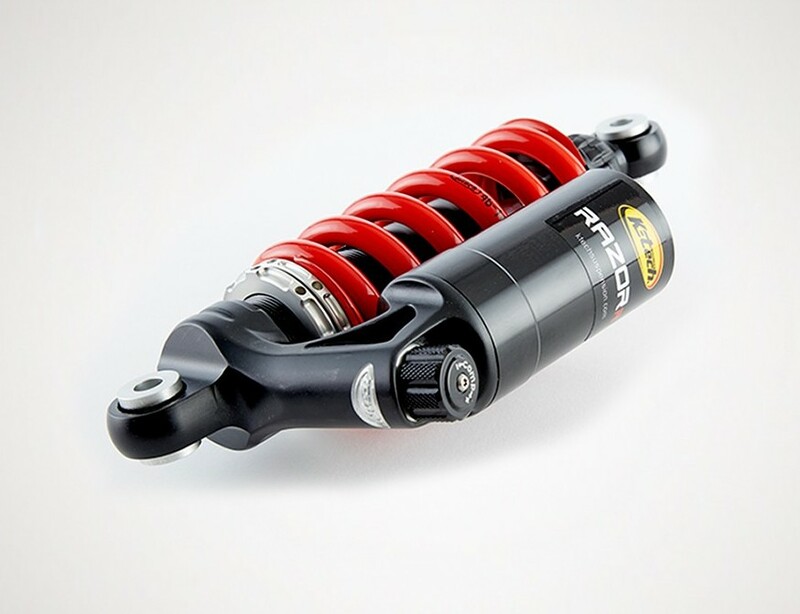 Springs are either blue or black, or all-black 'nightline' shocks are available for £ extra. The pictures show a 'blueline' 630 and a 'nightline' 640. 630s and 640s are the same price, with 630s being the shock of choice where mounting space is limited. 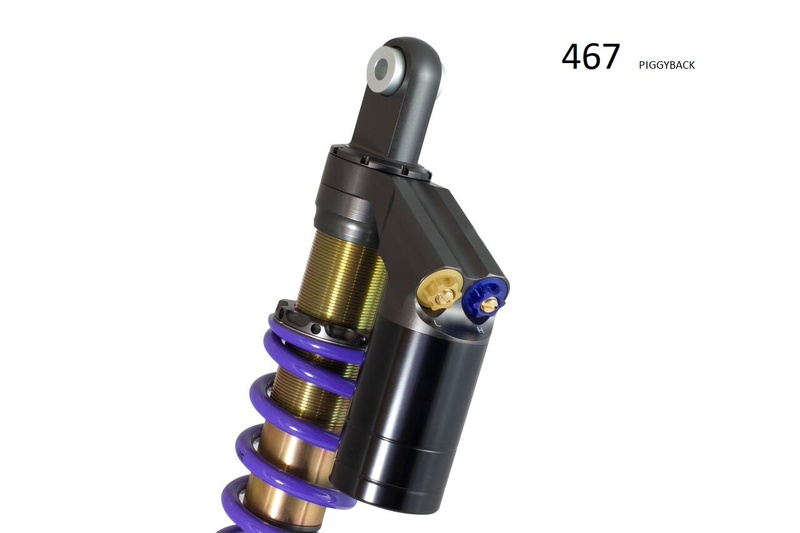 641, 642 and 643-series shocks have more damping adjust options and are aimed at track day and race bike owners. They all have the larger 46mm diameter pistons, with separate high- and low-speed compression damping adjustment (22 clicks of each) in addition to the rebound damping control. 631s have remote reservoirs connected by steel hydraulic hose, giving the option of mounting the reservoir away from the shock when space is tight, and also to locate it where the airflow can best cool it. 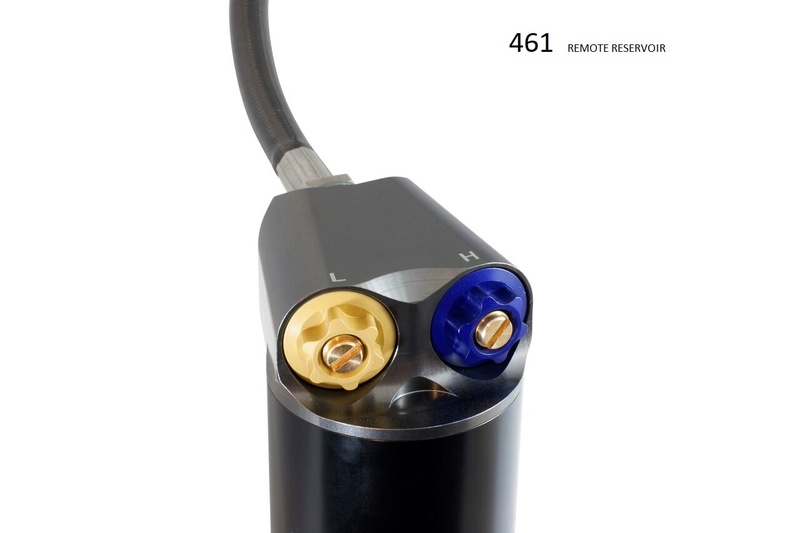 642s have the reservoir mounted 'tradtionally' in line with the main shock body, while 643s have the reservoir mounted either at right-angles to the top of the shock, or on a swivel mount to optimise mounting position. 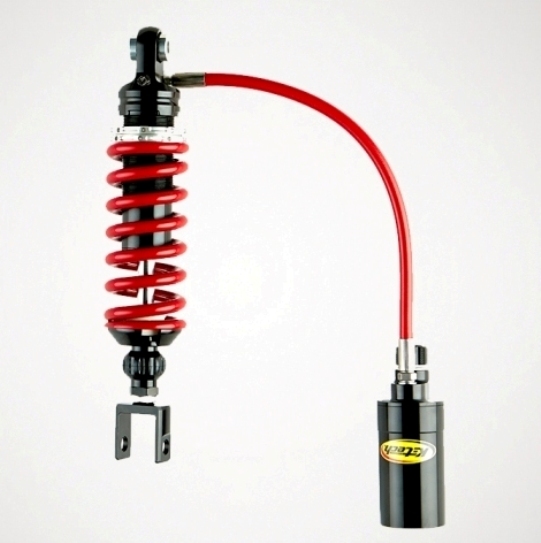 Springs are either blue or black, or all-black 'nightline' shocks are available for £ extra. The pictures show a 'nightline' 641 and a 'blackline' 642. 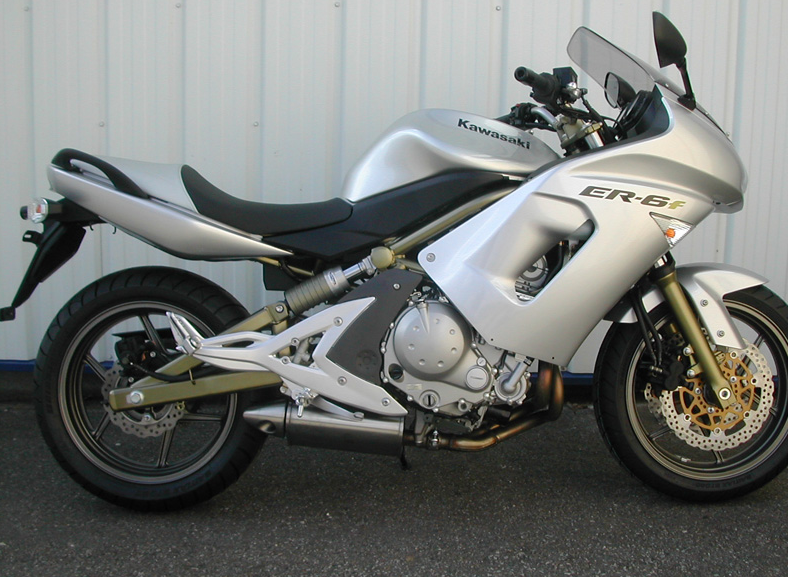 There are various bike-specific configurations in the 643 series, and prices vary depending on the application. A newcomer to the rather crowded field of aftermarket monoshocks! Launched in Spring 2012 by Mike Capon, who has forgotten more about shocks than most people ever know..... After designing and building shocks with EMC, Mike left the company a few years ago, and is now building his own range of shocks, already with plenty of race wins and two world championships to his credit. Primarily for a wide range of motorcycles, with over 400 models in the current range, Mike also loves to build shocks for trikes, quad bikes and sidecar outfits as well. These shocks are based around a twin tube / sealed gas cell design, to ensure consistent performance plus comfortable ride even when working hard and getting hot. Spherical bearings are used wherever possible to ensure proper suspension freedom of movement. Production quality and finish are excellent. 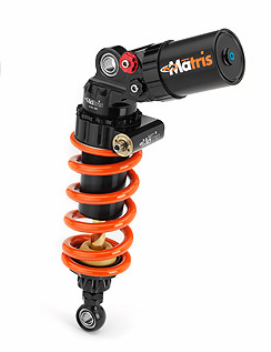 All M-shocks are built to order to suit rider (and passenger/luggage) weights. As well as preload adjustment via C-spanner, the shocks have adjustable damping via a 48-click knob which adjusts both rebound and compression damping in balance. M-shocks are rebuildable and come with a 2-year unlimited mileage warranty, all at the same price. List price is £350, our price is £339 delivered. A bargain for a top quality built-to-order shock! Also available for most of the bikes in the M-Shock range is the M-Shock2, which offers independent adjustment of rebound and compression damping via separate 48-click controls, giving a wide range of options in matching bike characteristics, road conditions and rider preferences. Brilliant value at £439 delivered. BMW owners should make a note that M-Shock make a range of front monoshocks to fit over 20 telelever models. They have lightweight alloy bodies, stepless preload adjustment, 14-clicks of balanced damping adjustment, and are supplied with a 2-year warranty at only £225 delivered. 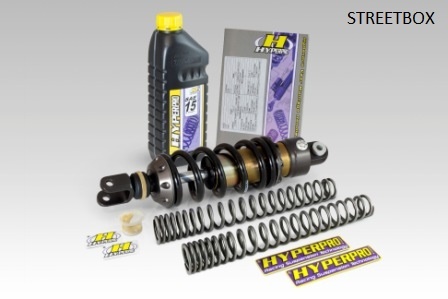 Hyperpro are a Dutch company established by experienced suspension engineers in the early 90’s. 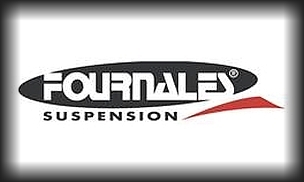 For more than 20 years, they have been manufacturing quality suspension products, and are best known for their springs. More progressive than most, Hyperpro springs can transform the everyday performance of most makes and models of motorcycles. Their range encompasses progressive and linear fork and shock springs, bespoke made shock absorbers, steering dampers and lowering kits which can take the form of replacement linkages or springs. All products are designed and manufactured in Hyperpro’s own factory in the Netherlands. Their warehouse stocks about 30,000 springs covering around 2500 bike models. The benefits of very progressive springs are increased performance and comfort. Smaller bumps are taken more smoothly while larger deflections cause the springs to harden up and so retain control rather than bottoming out. They are also more versatile in coping with varying passenger/load weights on the bike. 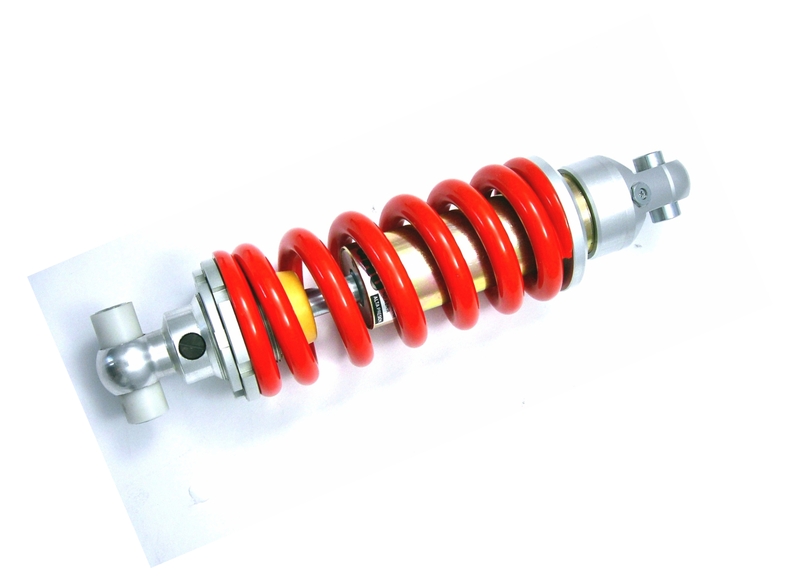 As well as selling their own shocks, Hyperpro have developed a wide range of springs designed to replace the spring on your original shock, as most standard monoshocks have cheaper straight springs, not higher performance progressive ones. Please ask us if you’d like a price on a replacement spring - although we suggest that you only consider this option if your shock is still in good condition, probably with less than 10,000 miles on it. Most popular shock in the Hyperpro range is the 460 model. This emulsion shock has 50 clicks of rebound damping adjustment plus stepless preload, a 46mm piston and strong 16mm rod for stability. If Hyperpro purple clashes with your bike colours, black springs are a no-cost option. Please note that where a bike's shock mounting angle is more horizontal than vertical, it is necessary to install a gas separator piston to keep gas and oil apart. These models are designated 466, and are priced higher than the 460 model. Higher performance models - the 461 has a separate hose-mounted reservoir and the 467 has a separate piggyback reservoir - are available depending on the bike. Bladder technology is used to separate the oil from the nitrogen gas in these reservoirs, to maintain shock performance under demanding conditions. Adjustment includes 30-click compression damping, with separate high and low speed compression damping on some models. Please ask for details and prices of the shocks Hyperpro list for your bike. The best value in Hyperpro's range is the Streetbox. 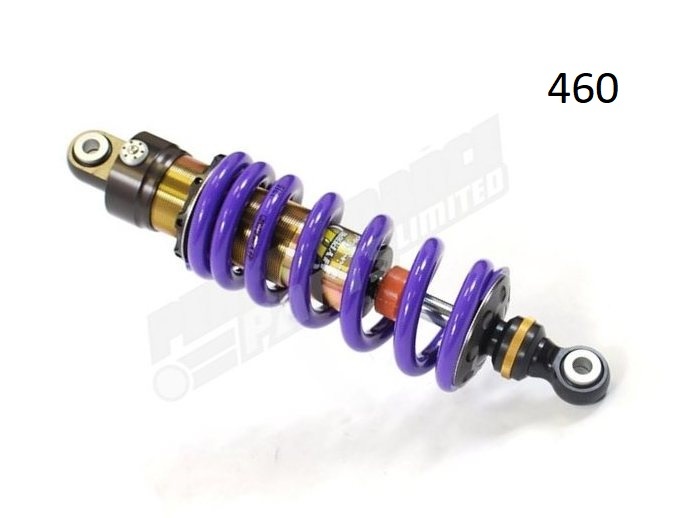 This is a combination of a 460 shock with a pair of Hyperpro’s renowned progressive fork springs, at a good discount to the cost of buying them separately. Please contact us for a price. All Hyperpro shocks are built to order taking account of your weight and riding habits, and you can have a non-standard length shock if you need to raise or lower your seat height (within safe limits of course). All Hyperpro products are KBA/GTU/TUV approved. Delivery takes approx 3 weeks. Nitron are not only one of the world’s leading designers and manufacturers of race suspension (for both bikes and cars) - they are also British! Their products are all developed for racing use, and their road bike shocks use all the same technology and parts as the full race spec units, giving them dependable performance and reliability for year-round road or track use. The use of high grade aluminium and titanium results in lightweight but strong shocks that are also well protected against corrosion. 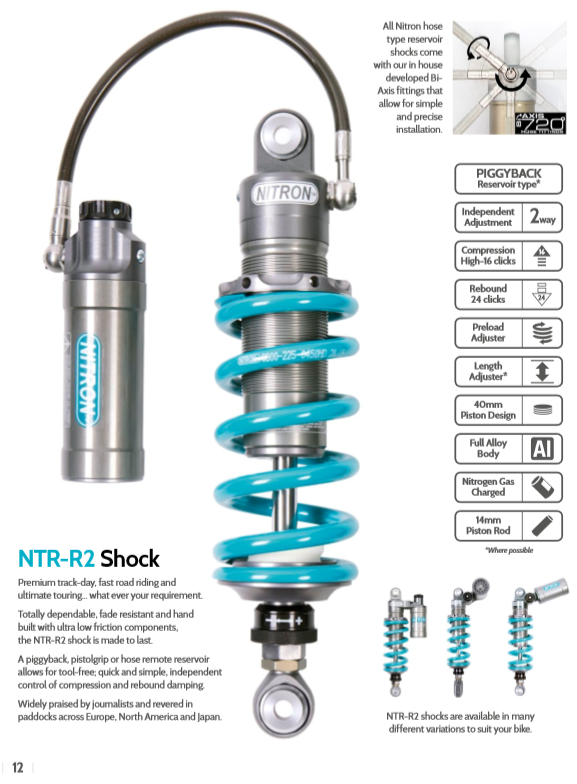 The NTR-R1 is the main road bike shock in the Nitron range. It has 24-click balanced rebound/compression damping adjustment as well as stepless preload, a 40mm piston driven by 14mm rod, and most applications incorporate a length adjuster. The NTR-R2 adds a separate reservoir to the R1 spec, either piggyback or hose mounted, allowing 16 click compression damping adjustment and providing extra surface area to enable the shock fluid to stay cooler when working hard. 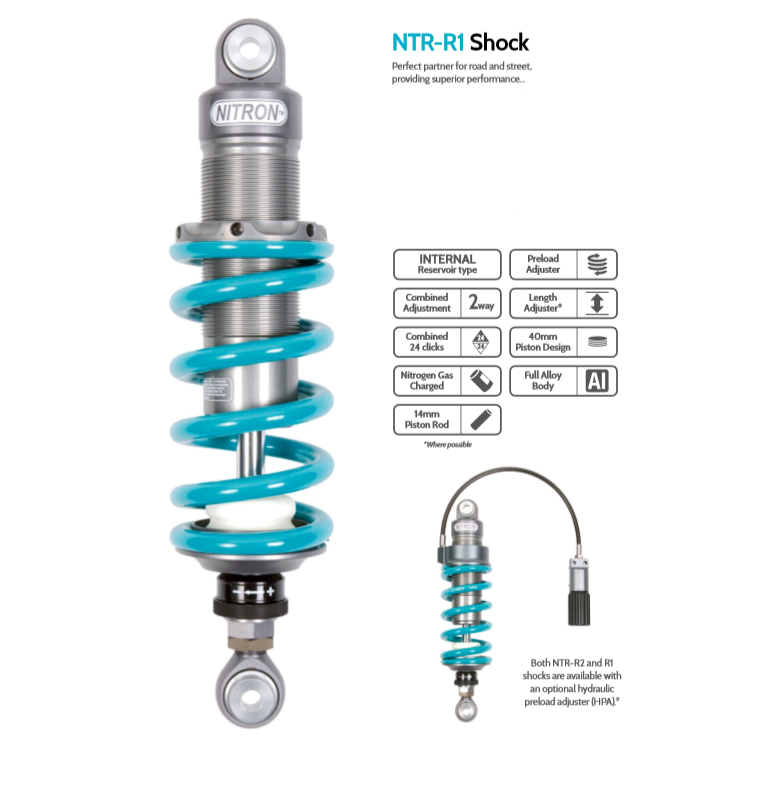 For maximum adjustability the NTR-R3 shock adds separate 16-click high- and 16-click low-speed compression damping to the R2 spec, ideal for giving track day riders and racers a wide range of options in matching bike characteristics, road conditions and rider preferences. 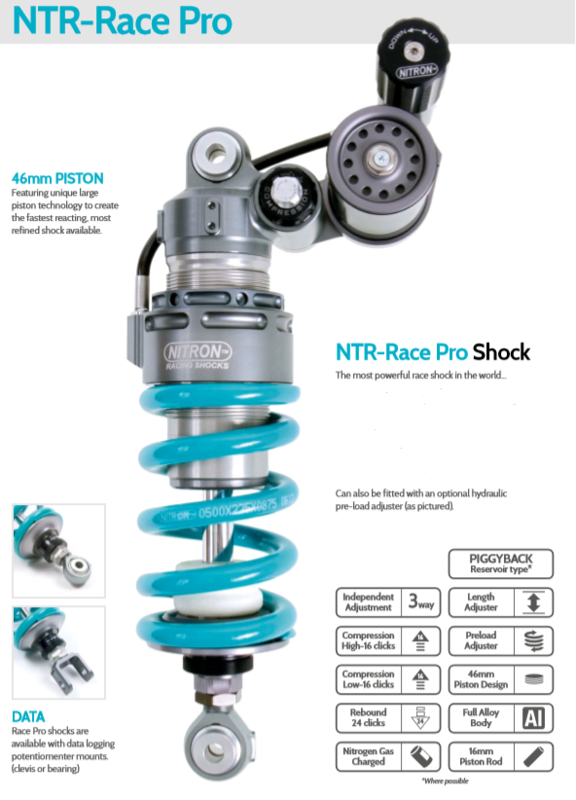 The NTR-Race PRO shocks take Nitron's excellent performance to a TT-winning level: By incorporating their class leading 46mm piston and ultra-strong 16mm piston rod, the Race Pro shock demonstrates outstanding levels of performance, damping control and adjustability. 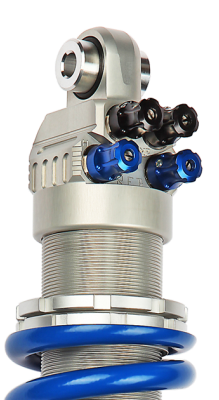 Piggyback, pistol or remote reservoir allows quick and simple independent adjustment of rebound and fast and slow compression damping. The fade resistant properties of the large piston, Nitron's unique valving, and use of highest grade materials ensure that the Race Pro is a proven TT and Superbike winner. For Dual Sport / Adventure bikes Nitron offer their ADV range. These shocks still come in the R1/2/3 spec variations, but with beefed up 46mm diameter pistons and stronger 16mm rods. Remote hydraulic preload adjusters are available for most models in the range, but as ever it's an expensive option at �200 incl vat or �235 for ADV shocks. All Nitron shocks are custom built, valved and sprung to suit your weight, any passengers or luggage carried, and riding style. They come with a 2-year warranty and are fully rebuildable and re-valveable. If you're not a fan of the factory style turquoise, black springs are a no-cost option. 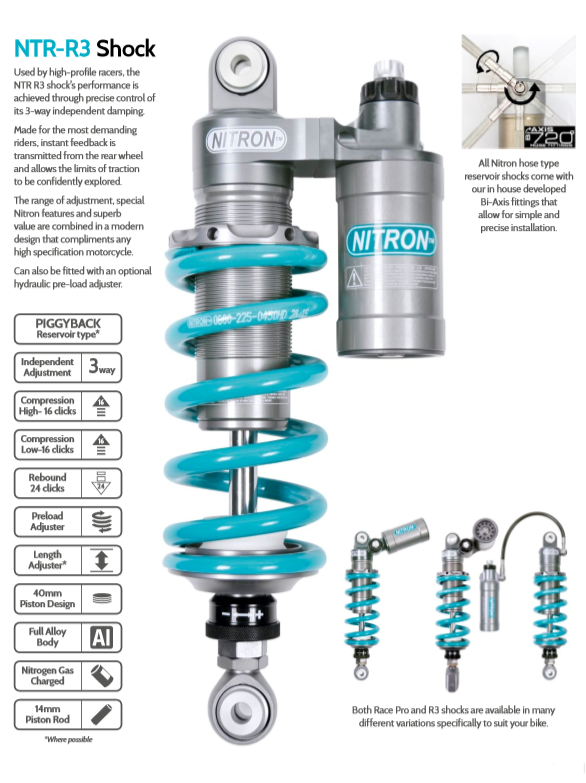 Nitron design their shocks to suit individual bikes, and recommend the best reservoir configuration for each bike. As a result, prices vary - ask for a quote for your bike. UK Company K-Tech have been building very successful race bike shocks for more than 25 years. They are supremely well engineered, top performance shocks. At the 2017 TT over half of top ten finishers in all TT races were riding K-Tech Suspension. And 60% of podium winners were on K-Tech. Brilliant, and they're made in the UK!! For monoshock bike owners, K-Tech's top of the range DDS Pro shock goes from strength to strength; and they are now steadily expanding their range of applications to include sportier road bikes as well as racers. Middle weight bikes are served by the Razor-R / RR range, while there's a Lite version of the DDS Pro if you're not into full-on racing. 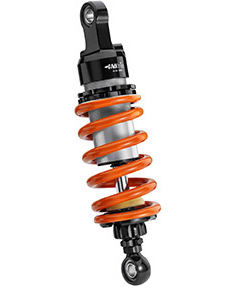 All K-Tech shocks are custom built, valved and sprung to suit your bike, weight and riding habits. They come with a 2-year warranty and are fully rebuildable and re-valveable. The K-Tech Razor-R shock absorber offers middle weight road bikes refined handling and enhanced performance over the standard equipment. Increased performance and control result from separate compression and rebound damping adjustment, together with the cooling effect of a discrete hydraulic reservoir. Stepless preload and damper length adjustments cover all the options. A Razor-R Lite version, an in-line shock without separate compression damping adjustment, is available for some bikes (including MT07, MT09 & YZF-R3) at £415. 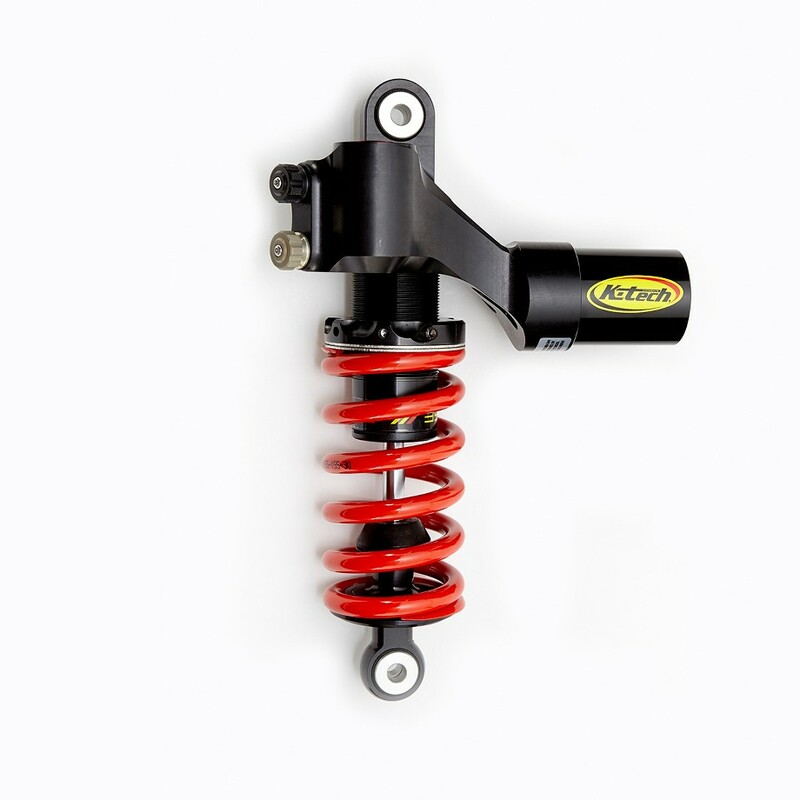 The K-Tech Razor-RR shock absorber is an enhanced model designed for track day/race use. Featuring all the same benefits as the Razor-R, the RR model has optimised internal settings to enhance performance for track orientated use. The K-Tech DDS Lite rear shock has been designed for the customer that demands a high level of performance at a competitive price. Sharing all the same high quality components as the DDS "Pro" version the DDS "Lite" performs to the same high level without the hydraulic spring preload adjustment or the "unique" Bypass Valve adjustment that is found on the "Pro" version. This shock can be upgraded to the "Pro" specification at a later date. With 32 clicks each of rebound and compression damping adjustment, stepless preload and damper length adjustment, and K-Tech's unique DDS damping technology, these shocks are special. The K-Tech DDS Pro rear shock has been designed for use at the highest level of racing and developed has continued during successes in major championships around the world. Like all other K-Tech products it has been designed and manufactured in the UK using the latest design software and highest grades of materials. It has full 5-way adjustability including K-Tech's unique 16-click ByPass Valve adjuster which controls both compression and rebound damping adjustment to assist with chassis control at low velocity shock movement to enhance tyre feel and grip. The DDS (Direct Damping System) uses a smaller piston rod which keeps the system more stable over a wider temperature range due to its small displacement. Damping is controlled by a 32mm piston which allows the use of larger shims for improved feel. Perhaps the classiest looking monoshock? Italian company Matris have been manufacturing seriously good monoshocks, front cartridge kits and steering dampers since the 1980’s. Due probably to the high prices and a lack of much sales effort in the UK there are few of these excellent shocks around so far. Designed with high tech computer systems and precision manufactured using top quality materials the internal friction level has been minimised, high temperature stability is improved, and damping adjustment made very precise - the change in damping is noticeable with every click of adjustment. The KD single adjustment shock is intended principally as a road shock. It uses a single damping adjuster to make it very easy for a road rider to get the right set up for their own personal use. It also has spring preload adjustment and in most cases ride height adjustment. Many are also available with the addition of the Hydraulic Preload Adjuster. The K two way adjustable shock is a more sophisticated unit intended for road and track use. It uses two damping control adjustments to independently control rebound and compression or bump damping. Ideal for fast road or track day use. The R three way adjustable shock is intended primarily for race and track use with specifications the same as the two way adjustable shock, except with the addition of independently adjustable hi and low speed compression damping. It is ride height adjustable and is fitted with a Hydraulic preload adjuster as standard. All shocks are fully rebuildable and re-valveable. With a Matris shock absorber, you can feel a difference with every click of damping adjustment you make and you can see it on a Shock Dyno! This is achieved by the absolute precise engineering of internal components. These shocks are built to order in the italian factory, so delivery can be a little slow. Normally 4 weeks, although they usually shut down for august! Extremely comfortable ride, never bottom out - if you or your passenger have back trouble, these are the shocks for you. 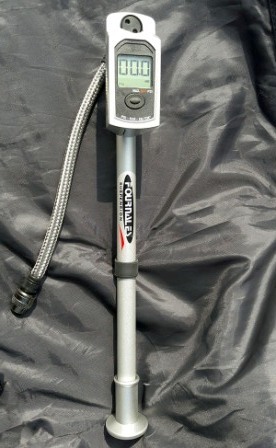 High pressure hand pump with digital display (pictured) only £39 when bought with shock. BIKE REVIVAL on 0203 302 0390. We specialise in motorcycle suspension. If you're looking for shock absorbers for your Japanese, European, British or American bike we have a range starting from £49.50 a pair. Or you can spend £100s!!! 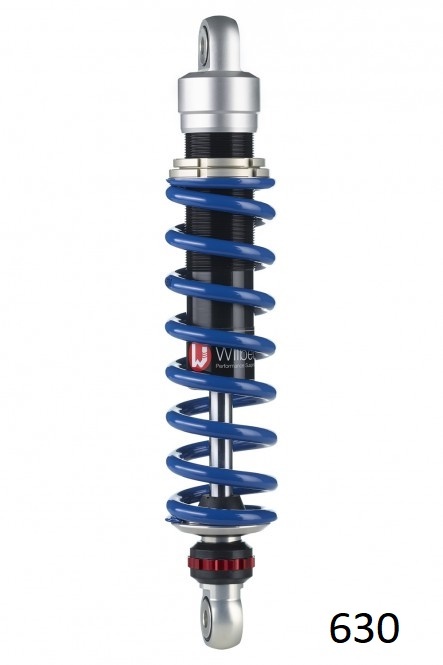 - we aim to sell a range of shocks for most bikes. We're happy to advise on the most suitable shocks for your needs and your budget..... just phone or send an enquiry with details of your bike. All our prices include vat and delivery to most of UK mainland!! Don't miss any news or offers. If your inbox is overflowing and you change your mind, just send us an email with "unsubscribe" in the subject line.